Another month – another Blitz! October sees the State Herbarium participating in another ‘blitz’ – this time a BioBlitz! A BioBlitz involves a team of scientists and naturalists working with the public to discover and record the life of a park or reserve, normally close to or within a city. BioBlitz events are usually run over a day and evening and include activities for all ages, experienced and novice naturalists, and anyone who wants to contribute and learn. In South Australia, Dr Philip Roetman from the University of South Australia has embraced the BioBlitz concept and, in collaboration with the Department of Environment, Water and Natural Resources (which includes the State Herbarium of South Australia), the City of Marion and the City of Salisbury, formed a group called the Discovery Circle, which supports local BioBlitzes and other citizen science projects. Warriparinga Wetland offers habitat and safe breeding grounds to native birds and fauna. Photo: Discovery Circle. 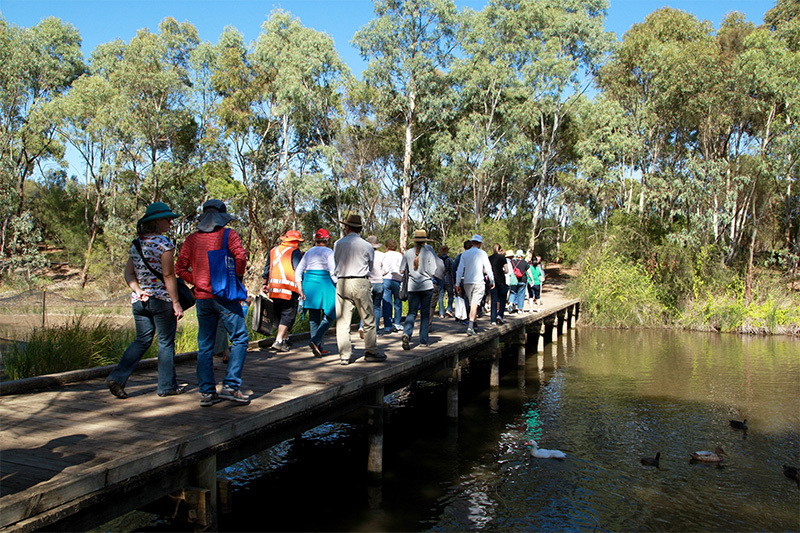 The October BioBlitzes will be held on Saturday 8 October: Cobbler Creek (see our forthcoming October Plant of the Month and Good Living’s Park of the Month for more information on Cobbler Creek Recreation Park) and on Saturday 29 October: Warriparinga Wetlands. The State Herbarium will be leading groups interested in discovering the reserve’s vegetation. The Cobbler Creek BioBlitz will run from 9.00am – 9.30pm and will feature wildlife on display, searches for birds, wildflowers and mammals, plus spotlighting, nature play, nature poetry, nature art, kids sessions and bat detecting. The event is free but bookings are essential. This entry was posted in Events, News on 28 September, 2016 by Jürgen.